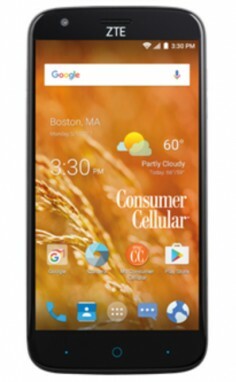 Consumer Cellular recently added the ZTE Avid 916 and Motorola Moto G5 Plus to its roster of Android-based smartphones. The Avid 916 (pictured), a variant of the ZTE Grand / Champ, includes a 5.5-inch 720p display, 1.3 GHz Snapdragon 210 processor, and 8 GB of internal storage. The phone has an 8-megapixel main camera with 720p HD video capture and a 2-megapixel front camera. The phone includes Bluetooth 4.2, WiFi, GPS, and LTE. It supports microSD memory cards up to 64 GB and ships with Android 5.1.1 Lollipop. The phone costs $80. The Moto G5 Plus, which Motorola released earlier this year, is available for $200 or four payments of $50. It has a 5.2-inch full HD display, 12-megapiel camera, and runs Android 7.0 Nougat.